Julia Park-Tracey (Tongues of Angels; Veronica Layne series; The Doris Diaries series) taught us how to craft effective dialogue. Susan Farren (The Fireman's Wife) shared strategies for creating meaningful settings in our novels. Contact your local bookstore for help locating authors who might be able to visit your classroom. Since YWP lets students choose their own word goals, students need to get a sense of how many words will be appropriate for them. Since the first question asked when assigned a piece of writing is, "How long does it have to be?" I recommend tackling the word goal lesson early on. I give my students a huge list of writing topics and have them write in a Google Doc on any topic they want for ten minutes. Then I show them how to check their word total (Tools > Word Count), which they multiply by six to see how many words they might write in an hour, and then calculate the words they could write if they wrote for an hour a day, every day, in November. This helps them choose a challenging but appropriate goal for themselves. Check out these recommended word goals by grade level. Day 1 of November is a "ready, set, start writing NOW" day! Students have their planning workbooks on their desks, and their chapter 1/page 1 ideas ready to go. I let them plug in to music so they can concentrate on their writing without being distracted by the tap-tap-tapping of writers around them. And - lo and behold - they all write furiously for a good 30 minutes! We take a stretch break and chat about how it's going, and then we get quiet and write for another half hour. See some of my mini-lessons here. When we come back from Thanksgiving break, we're in the home stretch. We write every day in class, interrupting our silence only when someone meets their goal. Then we all cheer, watch the "congrats" video from NaNoWriMo, and get back to work so we can all be winners. Once November ends, I have my students set aside their novel drafts until the new year. 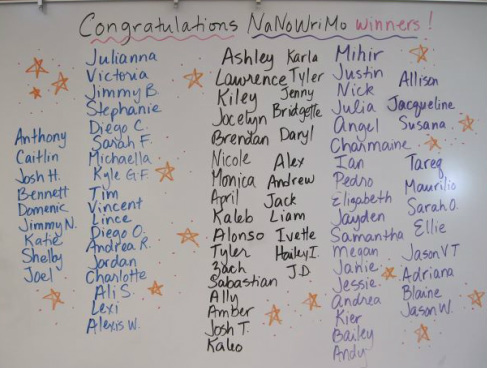 There are lots of NaNo-related activities we can do in December, and they are always surprised by (and proud of) their writing when they revisit it a month later. My Wri-Mos know that meeting their goal isn't the same as finishing their novel. 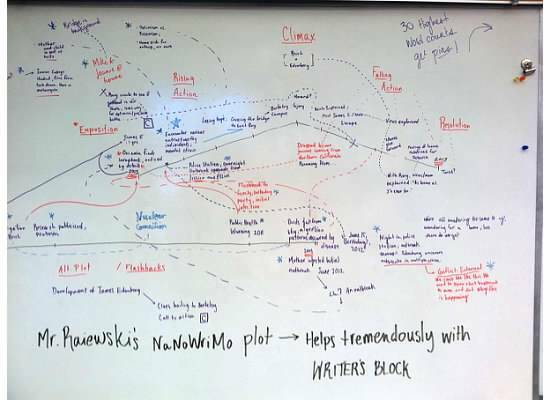 So, although NaNoWriMo is officially over and we have to move on to other curriculum, we try to carve out time to continue to work on our stories and get them ready for publication.